Here is a small collection of plants which we consider particularly worth growing, but which are not widely available from other sources. Propagation and cultural suggestions are based on my experience growing these plants in western NC, at 3500′, Zone 6. Mountain Gardens introduced this extremely valuable species to cultivation in America in 1990. An herbaceous, perennial vine, hardy to at least 0°. The slender stems bear 1-2″, 5-parted leaves, tendrils (Cucurbit: squash family), and tiny greenish flowers (male and female on separate plants). They can run or climb to 30 feet in a season (probably more in warmer areas). Easily propagated by division of the spreading roots, or stems will root at the nodes in moist soil. Prefers moist soil and light shade. Emerges when soil is warm in late spring. Of all the tonic/adaptogenic herbs, this is the easiest to grow and use: since it is the entire plant that is active, you can harvest the vine, there is no need to dig. Just make a cup of tea from the easily dried herb to enjoy its extraordinary health benefits: more ginsenosides (active components of ginseng) than any other plant, including ginseng itself. In TCM, considered a qi tonic, entering lung channel. Lowers blood pressure & cholesterol, used for prevention & treatment of cancer & tumors, anti-aging. Also in demand by race-horse owners. An evergreen, perennial herb forming a mound of bold foliage to about 12″, with 30″ stalks of small white flowers in early spring. Like its mustard-family cousin watercress, it prefers to grow in or beside cool running water. Seeds germinate well after a period of cool, moist stratification; clumps can be divided. This is the true source plant for the fiery condiment served with sushi; highly esteemed by many even though they have probably never tasted it, since almost all the “wasabi” in America is made from horseradish powder and green food coloring. Packet (50 seeds) = $10. 1 gram (200+ seeds) = $35. Price includes domestic postage; add $6 for international shipment ($16/pkt, $41/gram). Limit is 10 grams per customer. Please email joehollisherbs@gmail.com to inquire. The seed is best planted immediately in moist soil and will germinate next spring. The seed must not get completely dry, and requires a period of cold to germinate. For more details on germination and cultivation, click here. Please note that this is seed-grown wasabi, not one of the named varieties (Duruma, etc) which make giant roots – those are propagated by tissue culture. We market the leaves of our wasabi to restaurants. For more information about growing wasabi in NC, click here. To learn when our wasabi seeds and plants become available, use the form below to sign up for email updates. Sign up with your email address to receive news and updates about wasabi plant and seed availability in upcoming years. Biennial herb to 5′ with dissected leaves and small white flowers in umbels, late summer. Prefers a cool, moist (mountain) climate, rich soil and light shade. Fresh seed germinates readily in spring, often self-sows here. The Chinese grow larger roots by pinching out the flower buds in the second year. The foremost blood tonic in Chinese medicine and thus a very important women’s herb, sometimes referred to as ‘women’s ginseng’, although men are certainly not immune to blood deficiency. Excellent potential crop: I don’t think there is any domestic or organic dang gui on the market. Mountain Gardens is pleased to introduce the finest new salad greens / edible flower in a generation. This is a winter annual in the mustard family with showy lavender-pink flowers to 2″ wide. Germinates readily; hardy to at least 20F but won’t make much growth at such temperatures. Better in coldframe or under row cover (or in a slightly warmer area). Both leaves and flowers are very tasty, the large, substantial leaves have a spicy flavor like roquette (mild enough for salad, even when in bloom), the flowers are pleasantly sweet & sour – a good addition to winter and spring salad mixes, and an exciting new edible flower. The Chinese prefer to eat the entire flowering stalks. Recently reported to have the highest protein content of any of the Brassicaceae. A robust hardy perennial herb to 8′, with a thick stem, large bipinnately compound leaves, and small greenish flowers in a tall, branching spike of round umbels, followed by small purple fruit. A very imposing herb. Spreads by roots to form colonies in rich, moist part-shade. Can also by propagated by cold-stratified seed. The blanched, early spring shoots are a prized, ‘luxury’ vegetable in Japan (sort of like Asparagus for us); I don’t think anyone is marketing it in America. This is the only plant in the ginseng family commonly used for food, and probably has tonic properties which may account for its desirability. Biennial or short-lived perennial herb forming a rosette of elongated, finely toothed leaves, often red-tinged. Small pink flowers in upper axils of 2′ branching stems, followed by slender pods which split to release feathery seeds. Easily propagated by seed, sometimes self-sows; average garden soil and sun. According to Maria Treben, famous Bavarian folk-healer and author of “Health from God’s Pharmacy”, this is the sovereign herb for prostate problems. Most other herbals don’t even mention this obscure herb, but any addition to the skimpy list of beneficial plants for the male reproductive system is welcome. I’m not aware of any scientific data, pro or con, but it seems to work for me. A perennial herb with strong, arching stems to 5′ from a thick, branching root. Broadly lanceolate leaves, beneath which dangle small clusters of greenish, bell-shaped flowers, followed by dark blue berries. Seed germinates readily after a period of cold stratification; roots can be divided. 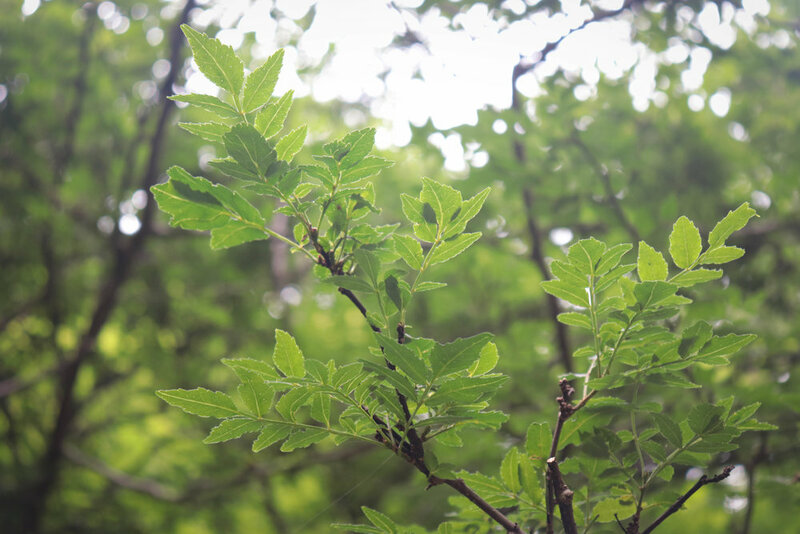 Native in rich deciduous woods; grows larger in sun, provided soil is rich and retains moisture. a) it’s a beautiful native plant for the landscape, and b) it’s delicious – particularly the spring shoots (harvested before the leaves unfurl), which resemble and taste like Asparagus but are, if anything, more tender. The flowers and young fruits are also edible, with a sweet flavor reminiscent of green peas. [also, c) medicinal – the Asian species are used as tonics in Chinese medicine]. Native perennial herb with deep strongly aromatic roots and 2-3x divided, toothed leaves. Small white flowers in umbels, summer. Seed germinates well after a period of cold. Rich soil: woods, wood margins in mountains. This attractive herb is the east coast relative of Osha and member of a genus noted for tonic properties in traditional Chinese medicine. Not found in herbals. Considered aphrodisiac in afro-american root doctor tradition. The leaves are prized spring greens of the Cherokee. This is a rare, endangered species of Apios (American groundnut) a well-known perennial vegetable / wildfood plant. This species makes only a single tuber, which increases in size with age. Makes a very strong vine, much stronger than A. americana, with large showy clusters of pink flowers. Legume family / nitrogen fixer. A very beautiful native wildflower of rich coves. An annual or biennial herb to 4′ with large blue bell-shaped flowers in late summer. Will self-sow in rich soil and shade. Leaves are a preferred Cherokee spring green. 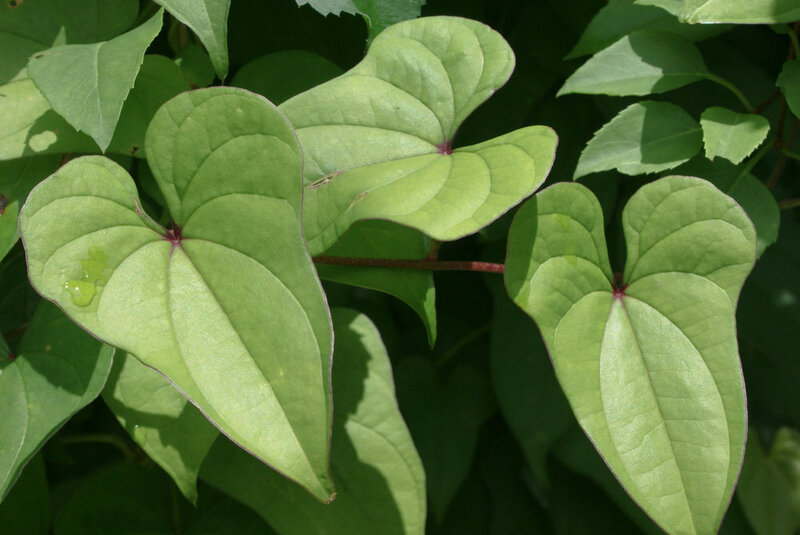 A strong herbaceous perennial, twining climber, with strongly-veined, heart-shaped leaves, and panicles of tiny, white, fragrant flowers. Propagates readily from aerial bulblets produced in the leaf axils, resulting in tangled masses in waste areas where it has become established locally. A very highly regarded tonic food/medicine in the orient. The fresh tuberous roots (to 3 feet, straight down) command a high price in Japan, where they are even grown in buried plastic tubes to facilitate harvest. Ramps ethically harvested by leaving the roots in the ground. This native woodland perennial herb is a spring ephemeral, each slender bulb producing one or two 8-10″ elliptic leaves which last only from early to late spring. A ball of small greenish flowers on a naked, 6-12″ stalk in summer is followed by shiny black seeds in husks. Seed germinates readily after cold stratification. Very rich and moist areas of deciduous woods, often in extensive carpets. But not for long: the arrival of ATVs, and a surge in popularity coupled with unsustainable harvesting practices (digging up the entire root), means that the ramp, long since exterminated from all easily accessible areas, is no longer safe in its remote sanctuaries. This locally popular spring treat (ramp ‘festivals’ are a Southern Appalachian tradition) has been discovered by gourmet restaurants, and the combined demands signal the approaching end of those extensive carpets and/or an exciting opportunity for growers with suitable habitat. seeds available. bare-root, flowering-size plants available in April & May. We can also ship fresh ramps in season (early spring) to homesick mountaineers, restaurants, and anyone else wanting to sample this gourmet wildfood.